The Liberator Today: Will an Improving Economy Save Obama? Will an Improving Economy Save Obama? Record low natural gas prices are propelling manufacturing. The EPA couldn't react fast enough to restrict fracking to kill of this particular goose laying golden eggs and it got too close to the election, so Obama watered down proposed EPA rules. This fact [low natural gas prices] has unleashed the biggest US manufacturing boom in decades. Take for example the US steel industry. Reuters News reported that, "America’s steel industry, for decades a symbol of industrial decline, is betting on natural gas to make it more competitive against foreign producers. U.S. oil production on private land is way up, particularly in North Dakota, far outstripping Obama's shutting down of Gulf oil production and closing off federal lands, later re-opened. From the WSJ: The use of new drilling techniques to tap oil and gas in shale rocks far underground helped add about 158,500 new oil and gas jobs over the past five years, and economists think it has created even more jobs in companies supplying the energy industry and in the broader service industry. Manufacturing in the U.S. is making a comeback. From the Carpe Diem blog: More than 17% of U.S. job growth this year has been in manufacturing, even though that sector represents less than 9% of total payrolls. Further, manufacturing jobs that have gone to China have been returning to the U.S. U.S. manufacturing has become attractive for some companies as Asian wages have surged over recent years and the wage gap between the U.S. and China has narrowed. The drop in the dollar over the past decade has also made U.S.-produced goods more competitive. And higher oil prices have increased the cost of shipping goods across oceans, making domestic manufacturing more appealing. The Gallup survey of Economic Confidence has hit a new high. The Gallup Economic Confidence Index broke through a barrier last week, surpassing -17 for the first time in the four-plus years of Gallup Daily tracking in the United States. The index now stands at -16 for the week ending May 20, up from -18 in each of the prior two weeks in May, and from -21 in late April. However, the index is still negative. The open question is whether this good news will lift the U.S. economy and if Obama will get any credit. I contend that he should not, because the health care law, his energy policies and refusal to deal with federal spending have all harmed the economy. The American people are pragmatic and tend to give the leader credit when things are going well. Uncertainty over health care and the regulatory climate are still holding back a full recovery. 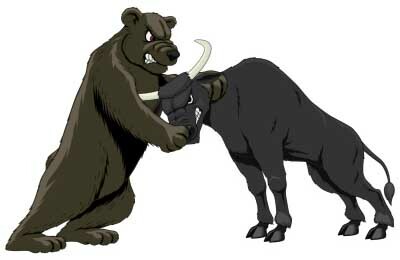 It's an open question as to whether economic bulls or bears will triumph. Any flickers of recover are too little too late...and I doubt anyone will credit the president with any of it. Gas and bread prices are still WAY up...with no relief in sight for summer. The China effect will take too long to make a real effect on macro job numbers. And your last paragraph really says it all. I think not, I just read that economic growth projection for the next 12 months is at 1.7%..not even enough to sustain....this....so firstly, I don't think the economy will improve, in any real sense. Even if it does a little, 3 and 2/3 years of pain won't be washed away with 3 or 4 paychecks. 'Economy' voters will still blame the Kenyan Kook for the problems rather than credit him for a few short weeks of answers. People have long memories. 2. I don't think this election is about the economy anyway, enough people are finally getting the point that the economy is a symptom of bad policy, bad debt,loss of work ethic and fear..not the other way around. I believe there may finally be enough of the undecided middle to have the guts and take a stand for policies of growth, not growth in spite of policy. 3. Obama is a fool, and he can't keep from acting like one, and the media's attempts to cover this fact up is getting laughed at. 4. More than maybe any other election..the electorate has made up their mind..the true undecided group of likely voters is uncharacteristically small for this part of the election cycle, and historically, undecideds trend even more away from the incumbent. Steve, thanks for all of that. I certainly hope you're right. As to Romney, I think he has the makings of a great President as well, despite a shaky track record as governor of Massachusetts. With regards to the question about whether the election is about the economy, I think it depends on who you ask. I think the undecideds don't make the deep connection you do; they just know something is wrong and vote the party in power out of office. SarahB, gas may fall. One thing I have noticed is that after oil prices rise, they fall. DeMaio vs Fletcher/Filner or Something Else?